Do Herbal Supplements Help You Lose Weight? Evaluating the relative merits of herbal products that claim to facilitate cause weight loss. Hoodia, Guarana, Ephedra, Coca Leaf. When the news first came out -- that a crazy, ugly, spiny, dwarfish cactus from South Africa had been used by centuries by the Kalihari Bushmen to stave off hunger and to provide energy on long, hot, difficult treks -- well -- it seemed too good to true. According to reports, individuals who took the supplement no longer felt hunger, and the pounds simply melted away. What, precisely is "hoodia?" Why are the claims being made, and what kind of merit do they have? When evaluating information gained from the Internet, how does one determine whether or not there is bias, or a vested interest in the way the information is presented? Instructions: Click on all the links. Read the information presented. What kind of information is being presented? Is there evidence of bias? Are the reports balanced, fair, reliable? Why or why not? Hoodia, Green Tea, and 5-HTP as an Effective Solution for Weight Loss. Guarana is an berry found in South America, principally in Brazil, and also in Paraguay and northwestern Argentina in the Alto Parana region. 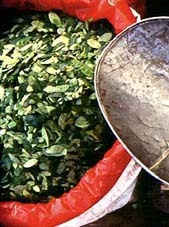 It is a plant that grows in the rainforest, and it is reputed to be effective at increasing energy while avoiding water weight gain, etc. According to reports, Guarana contains caffeine. Other articles discuss the effect on the metabolism. This is definitely the "bad boy" of body building and weight loss these days, due to the similarity to pseudo-ephedrine, the substance found in decongestants and cold remedies, and eagerly sought by methamphetamine "cooks" who follow unsavory (and dangerous!) procedures to extract the chemical. Ephedra is derived from a plant, which has medicinal properties. A traditional remedy against altitude sickness, coca-leaf tea has been a staple in the diet of Bolivians and Peruvians since time immemorial.The leaves are also chewed by Bolivian miners to help reduce the impact of the cold and the altitude. There is a tremendous difference between the coca leaf and the ultra-refined substance, cocaine. However, confusion exists in this arena, and many are not aware of the differences.